Kiana Hayeri is a young talented photographer who manages living and capturing the edges of our day to day experiences very well. I have known Kiana for 3 years now and I’m always impressed by how much she is willing to shift her life plans to pursue a project and sometimes make a project our of events that are out of her control. 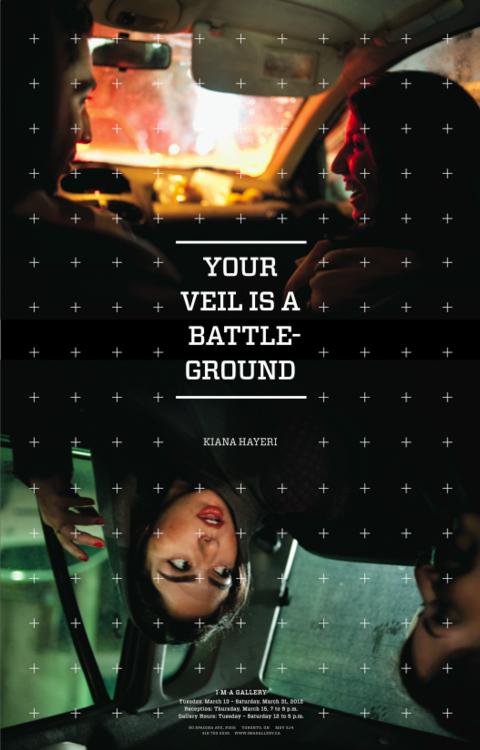 Kiana’s lates show titles Your Veil is a Battleground, first exhibited in Toronto, received much attention including an exclusive interview and centerfold in Globe and Mail. The two pictures I selected for the poster to me are the perfect illustration of the public / provate space debate in Iran. While in your car you behave as you like you are exposed to the outside. Although you are likely to be ok for the most part there is always a slight chance for an “authority” to question your behaviour in your private space. It seems like the very act of questioning is all it takes to apply the rules of public space to a private space. The definition and borders of these two spaces are of course always in flux.